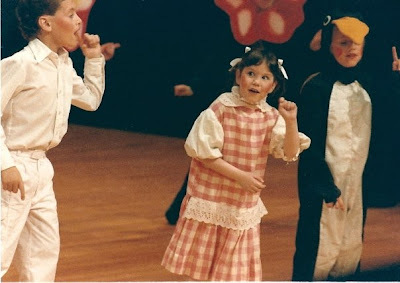 I was a theater kid. 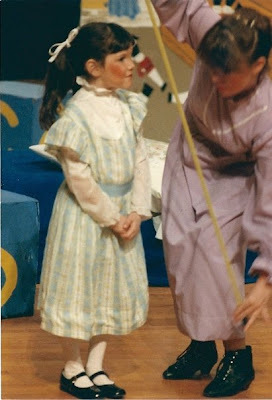 I started doing shows when I was four years old (see my post about how my love of beauty began), and I was immediately hooked. And, yes, it's because I LOVE performing ... but also, of course, because I love putting on makeup and transforming into another character. That really never held truer than during my time as Lizzie Banks in Mary Poppins. Caught in the action! Singing "Jolly Holiday" in what was probably my favorite costume of all time. Being measured before having to take medicine. Don't you love my patent leather Mary Janes? For me, being in this show meant not only singing "Supercalifragilisticexpialidocious" and "Spoonful of Sugar" ... but it was about getting to wear really pretty dresses, pigtails tied with ribbons and tons of rouge. Just look at those wide streaks down each cheek! A little much for everyday, maybe, but for performing in 1980s community theater? Perfect. Needless to say, I had a blast.